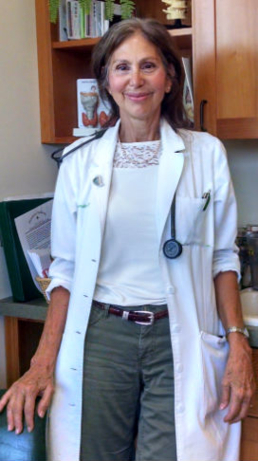 As someone who installed solar panels in her medical practice over ten years ago, Dr. Carol Gardner was something of a pioneer with solar energy in Chittenden County. She searched for a spot for her osteopathy practice, knowing that she wanted an environmentally friendly office that provided both free parking for her patients, and that was compatible for installing solar panels. “I designed it to be as green as possible,” says Gardner proudly. Her office uses both “active” and “passive” solar. “Active” solar refers to the photovoltaic panels on the roof, which generate electricity for the practice, while the “passive” solar refers to the way her office was designed to make the most of sunlight to light the rooms. For the times she needs electric lights, she made sure to install the most efficient lighting. She also works to divert waste from landfills by recycling. Her solar array, which was installed by Vermont-based Building Energy, is a 4.68 kw array, which produces about 5,148 kwH per year. Depending on weather patterns, her array offsets between 75 and 100 percent of her electric bill. Some months, this means that her statement from Green Mountain Power has no charge at all. In summer months, when the sun shines for more hours in the day, her electric generation can exceed her use, allowing her to build credits to apply toward the winter months when her generation will be lower. “Every day that the sun is shining and we’re using solar energy, we are reducing our carbon footprint. It just shows that one person, just me with my small family practice, can make a difference,” says Gardner. A meter connected to her panels reads that 77,500 pounds of carbon have been saved by her panel’s electricity production since it was originally installed. A typical solar array can pay off the initial investment in as little as five years through the savings obtained on electric bills. This was the case for the array at Preventive Health. After ten years, Gardner has never experienced any technical problems with her panels. Garner points out that homeowners and offices usually stay in the same location for at least five years, making the investment in solar a good financial decision. However, for Gardner, it is about more than the money. “It’s a good gift to the world,” she says. With Gardner’s values, environmentalism and health have some important commonalities. She stresses that making smart changes can be invaluable to health, and that for each person, it takes commitment for improvement to occur. The same could be said for transitioning to cleaner fuels and efficient technologies—an ongoing process that takes commitment and support for better planetary health. “We have to save the world. We have to reduce our carbon footprint,” she says simply. So when asked whether she has any advice for businesses looking to go solar, she doesn’t hesitate.